GREEN POWER OR GREED POWER? height proposed on the Oregon Coast between Wheeler and Garibaldi. The new onslaught of giant utility windfarm applications has brought a quandary to many people. "Shouldn't we support green energy?" "How will we meet our energy needs if we don't support it?" "Isn't it better than the alternatives?" I'll attempt here to give some personal observations. I have been a strong proponent of development of renewable energy for over 30 years. In 1972-73 I co-developed the Project Ouroboros at the University of Minnesota, one of the very first regionally self-reliant demonstration houses. My "Living Lightly" monograph in 1973 was one of the very first challenges to expanding energy use and a demonstration that we can reduce energy use dramatically while improving our quality of life. I was an energy researcher for Oregon Governor Tom McCall during the 1974 Arab Oil Crisis. As co-editor of RAIN Magazine in the 1970s, we were strongly involved in the development of wind energy and other forms of "green" energy. And still today, my Bank of Astoria project in Manzanita OR was one of four projects nationally to receive sustainable design awards in the 2001 AIA Architecture + Energy Program, and was voted one of the 2002 Top 10 Green Buildings. It is important to note that "supporting" development of green energy shouldn't mean supporting less desirable "green" options when better ones are available, nor of supporting applications that are not appropriate. I was personally involved in getting compost toilets approved in Oregon, but rarely support them today as low-flush toilets, biological wastewater treatment, and waterless toilet systems that require less sophisticated maintenance have been developed. Similarly, Project Ouroboros advocated and demonstrated active solar heating systems, but in the process we found that super-insulation, high-efficiency windows, passive solar, and interconnection of systems to reduce demand were frequently much more effective. So I don't believe blanket endorsement of anything is wise. We need to examine the whole interconnectedness of what is involved, not look at a single issue in isolation. We need to look at the specific situation we are dealing with and options available for it. "How will we meet our energy needs if we don't support green energy?" There are many pieces to the answer of that question, but perhaps the most important answer is that we cannot ever meet our energy needs. We cannot ever meet our energy needs ­ when those energy needs are continually expanded by increasing populations and energy-intensive ways of living. That is the prime issue, and the one so neatly sidestepped by corporate leaders who can think only in terms of larger markets. Germany already has over 7,000 windmills, but because of growth, its energy use is increasing 70 times as fast as energy is produced from those mills. The second issue is "What do each of the alternatives available give us - what specific costs and benefits, how do they really affect our specific problems?" It makes little sense to base an enormous windpower program on reducing greenhouse gasses and health impacts of air pollution, when their scale of impact on those problem is infinitesimal (65-90% of those problems come from mobile sources - automobiles, trucks, airplanes, rather than from any use of electricity). It makes far more sense to focus on easily available increases in vehicle fuel efficiency, and reducing need for transportation. Other alternatives to fossil fuels can give us equal or greater benefits than renewable energy. Adapting a less energy-intensive way of life need not cost more, and can improve our well-being while permanently reducing energy demand. Similarly, energy efficiency has a vast capacity obtainable at less cost than any energy generating sources. is also far more effective on the whole than any new generating sources. With renewable energy, many factors distinguish desirable solutions. Energy quality - using passive solar rather than expensive, high-quality electricity to merely warm our homes - usually gives far more favorable solutions. Point-of-use rather than utility grid solutions eliminate transmission costs and energy losses, while being far less vulnerable to sabotage and outages. Cascading mixed uses - where, for example waste heat from electrical generation is used for process or space heat - gives double use and efficiencies. Utility scale wind farms give none of these benefits. Regional appropriateness is another factor distinguishing desirable solutions. Hydropower in the Pacific Northwest is our liquid sunshine. Other areas have sunshine and passive solar power potentials appropriate to their conditions. Our broad and low heating season means that insulation is far more effective than in other regions. In cow country, methane digesters can solve multiple problems. Each region has special solutions that fit. We also frequently focus solely on single-dimensional examination of our problems. Dumping sewage in the river is the cheapest solution - downstream users be damned. But externalized costs in other dimensions of our lives need to be paid, and need included in our decisions. Wind, for example, does nothing to reduce other generating capacity needs. Period. There are times when the wind doesn't blow. Wind generators produce energy only between 25 and 30% of the time. They require we pay double capital costs ­ to build both the wind turbines and also backup generating facilities. All we really save is some fuel use, which can be gotten more easily by other means. The dispersed and low density nature of windpower means that inordinate visual, noise, economic, and community impacts occur in many proposed locations. That can be justified only if we have exhausted all better options first, and have no alternatives. This is definitely not the case today. Such impacts need to be included in costs. Alternatives such as super-insulation or roofing-integrated photo-voltaics avoid transmission losses and are virtually "invisible". We shouldn't accept negative impacts when alternatives are available without them. And lastly, windpower projects frequently have a unique negative impact. Many favorable windpower sites are in our most beautiful and most loved natural places ­ coastlines, mountaintops, places of immense natural power and places of healing and uplifting impact on the lives of millions of visitors every year. The destruction of such irreplaceable resources, solely for the production of small quantities of electricity whose need could be avoided through energy efficiency is unconscienceable. Even the American Wind Energy Society defines such places as the least desirable to develop for wind power. Wind turbines are huge industrial artifacts. 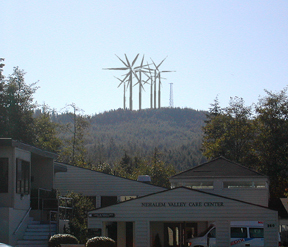 Placing them on top of a mountain turns that mountain into a mere support for a windmill. Three hulndred-plus flashing red lights can destroy the magical beauty of a starlit night at the ocean. Places have souls, and are vital spiritual, emotional, and psychological resources for us as well as having their own justification for undiminished life. "Green power" solutions in many of the utility-scale applications being proposed today are green only in the $$$$ of excessive tax write-offs and profits benefiting the far-from-green Enron-type corporations involved in their development. This is a greed-driven "gold rush" happening everywhere ­ not just on the Oregon Coast. County Commissioners in Kittitas County, WA, have issued a moratorium until regulations can be developed. Massachusetts Attorney General Thomas Reilly has demanded that the Army Corps of Engineers halt their review of a proposed 170 turbine windfarm proposed to occupy 28 square miles of Nantucket Sound, until a clear regulatory framework with safeguards to protect the public is established. We need to be explicit in defining what "green" really can and should mean, and not let the term, like everything else, be co-opted by corporate greed. "Don't we have a responsibility to do our share in providing for "green" energy sources?" No, we don't ­ we have a greater responsibility. Our real responsibility is to look at our root problems, to address our problems at their roots, and to find solutions that give the greatest benefits and lowest costs to our communities, our planet, and our souls.